Time to ring out the old and ring in the new year with this special New Years edition of Tunes Around Town! Not too much happening on Christmas Eve and Christmas but there are a wealth of show this weekend to make up the difference! 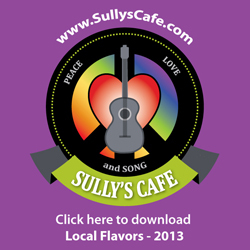 Merry Christmas and Happy Holidays from Sully’s Cafe to you all and all your families! Tons of great shows to give yourself this weekend before Christmas! TONS of great shows this weekend! Get out on the town in your ugliest sweater and show some local music support! Weather is cooling off but the shows are heating up! There’s a myriad of great shows this weekend, get out on the town and show your support!